Your Top 12 Questions, Answered Here! 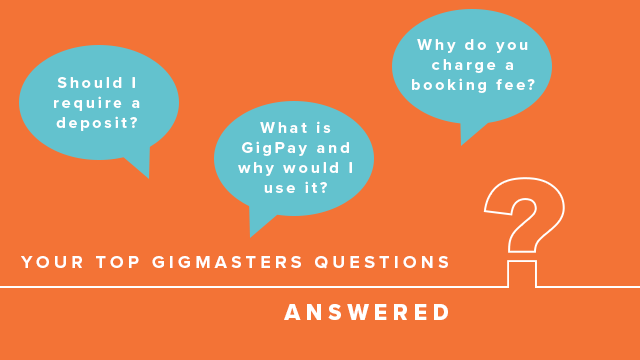 Our Account Services team here at GigMasters speaks with hundreds of vendors every day, answering questions about memberships, booking best practices, new GigMasters features, and more. We thought it would be helpful to answer some of the most frequently asked questions here in this blog. 1. What is GigPay and why should I use it? Making it as easy as possible for clients to pay is essential in today’s 'always online' culture. GigPay is a secure, free, and convenient way for vendors to receive payments from clients on GigMasters. By linking a bank account to a securely encrypted database, GigPay allows vendors to receive payments as quick as just 2 business days. It also makes it easy to collect deposit payments at the time of bookings and pay your booking fees directly from deposits. Over 80% of all GigMasters events are booked by members enrolled in online payments and 91% of the top 100 bookers on GigMasters use GigPay. Enroll in GigPay. 2. I received a negative review from a client and want to remove it from my profile! How can I do that? To maintain trust and transparency in our marketplace, GigMasters does not allow vendors to remove client reviews from their profile once a client submits one. However, you do have the ability to display your reviews in any order that you’d like. We suggest putting your best and most recent reviews at the top so clients see those first! The more positive reviews you get, the less harmful negative ones will be. Learn more about handling negative client reviews. 3. Featured Profiles: What are they and why would I want one? Featured Profiles are windows of ad spaces that maximize your business’ exposure by guaranteeing premium placement throughout the GigMasters site. With a Featured Profile, your profile will be displayed above search results in specific categories and locations where you're looking for more leads. If you’re already showing up high in search results, Featured Profiles probably won’t benefit you as much as someone who is a new member or someone who is showing up at the bottom of the search results. If you're showing up high in search results for your primary category (e.g., cover band), but not for other categories you service (e.g., dance band, variety band, rock band), you might want to give Featured Profiles a try for one of those. For location, we recommend choosing a larger metropolitan area (e.g., Chicago or Los Angeles) because they generate the highest volume of traffic. Although these areas are more expensive, they will give you the most amount of value. Learn more about Featured Profiles. 4. Why do you charge a booking fee? GigMasters charges a small booking fee to every booking made through the GigMasters site to cover credit card processing fees and general site maintenance. To keep costs affordable for vendors, the GigMasters yearly membership fees remain low and the booking fee is only applied when you are booked - if the client cancels, it is refunded. We recommend just building the booking fee into your original quote! On the quote page, it will calculate the booking fee and then you can just add it to your performance rate or travel and lodging sections before you submit the quote. 5. I'm getting requests that are too far from where I'm willing to travel. Is it possible to change that? Having a wide radius will of course get you more exposure, but if you find you're traveling too far and would like to adjust your travel radius or primary city/state, you can do that anytime by going to the Profile tab in your Control Panel. Update your travel radius. 6. I have a friend that is also an event vendor. If they sign up, do I get anything? Yes, we offer a referral bonus to any vendors that you refer and that purchase a GigMasters membership! For every person you refer, you earn a 25% commission of the membership cost - you could earn up to $124.75 per referral! Just visit your customized Referral Bonus Program page, copy and paste your exclusive link to your friends, and get paid when they sign up! 7. Should I require a deposit from clients? We definitely recommend that you require clients to pay a deposit at the time of booking. Most clients are willing to put money down to secure the date and it makes them feel like the booking is official. Deposits also protect you as the vendor in case of a cancellation. Clients are less likely to cancel if they have already paid a non-refundable deposit. If you're enrolled in GigPay, you can easily require a deposit. Whenever you're creating a new quote, just be sure to check the 'Request Deposit' box, enter the deposit amount, select when you'd like the deposit by, and choose whether it's refundable or not. 8. I have videos on YouTube and Vimeo from past events. Can I add those to my profile on GigMasters? Yes! Just send over the URLs to your videos on those sites to info@gigmasters.com. We can convert them and upload them to your GigMasters profile. 9. If I get booked for an event outside of GigMasters, do I still get credit for it? If you are getting bookings outside of GigMasters (e.g., through your personal website), you can add them to your gig calendar to show potential clients you are busy and actively gigging. You have the option to pay the 5% booking fee to get credit for the booking on GigMasters (which propels your rankings in search) and also enables you to accept online payments and receive a review from the client after the event. 10. What do I do if the cost of my service increases after the client has already booked with me? We get this question a lot from vendors like bartenders, caterers, and venues whose quotes can change up until the day before the event. If the original quote you sent to the client changes after being booked, just give our Account Services department a call at 866-342-9794 and they'd be happy to adjust it for you. 11. I provide two different services, is there a way for me to have a profile for both? If you fit into two different vendor categories (e.g., DJ and Photo Booth), you'll want to create two separate GigMasters memberships. After your first membership, every additional one you create is 50% off and the discount will apply every time you renew! Create an additional membership. 12. Can I/should I contact the client directly after I submit my quote? Yes, we recommend following up with the client via email or phone within 24-48 hours of submitting your quote. This gives you the opportunity to showcase your personality, professionalism, and excitement for their event. It also allows you to answer any questions they may have about the quote or your services. Have additional questions? We'd love to hear from you! Comment below or send them over to info@gigmasters.com.